We've never lived in a comfier time for fashion. With new sneaker trends popping up left and right, ask any fashion girl and she'll admit to you that her feet have been thanking her ever since sneakers infiltrated the mainstream, dethroning heels as the go-to fashion shoes. 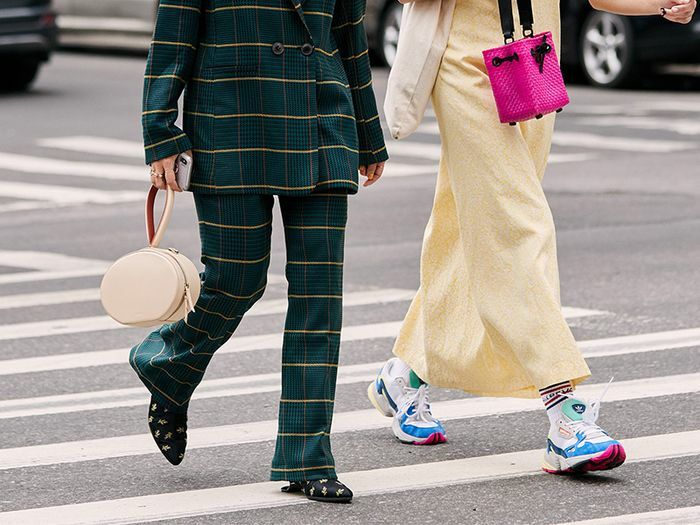 Former Who What Wear editor Aemilia Madden poignantly likened the growing popularity of the sneaker to the evolving values of modern women everywhere. "Finally women are choosing practicality over everything else. In a time when the daily news cycle leaves me constantly frustrated, I have little tolerance for discomfort in what I wear," she wrote. So, yes, our footwear choices go well beyond their aesthetic value. Just because we feel a whole lot more comfortable, though, doesn't mean that all of the trendy are doing our feet some good. Plot twist: Some sneaker trends are doing bad, bad things to our feet, according to podiatrist and Gotham Footcare founder Miguel Cunha. The doctor weighed in on the seven top sneakers of the moment, sharing which he'd be overjoyed to see you wear—and which he advises avoiding like the plague. Keep reading to discover and shop the best podiatrist-approved sneakers. Why: "While I wouldn't advise that your run in these sneakers (a running shoe is always best), these shoes are much better than most trendsetters—like the stiletto. These shoes have a rigid heel, which is intended to protect and cushion the ankle and the Achilles tendon, and a wide toe box which helps prevent foot issues like hammertoes, neuromas, and ingrown toenails. However, these shoes look like an exaggerated sneaker. They are unnecessarily bulky, and although they mimic a good sneaker, they are not quite as good as an Asics sneaker, for instance." Why: "This is a good walking shoe as long as the forefront of the shoe is wide enough for the wearer to accommodate her toes comfortably. My concern with these shoes is that they won't accommodate the feet as well as laced shoes as the feet progressively swell over time with weight-bearing activities." Why: "While the socks sneakers may feel comfortable as they snug the top of your foot, they are not advisable shoes, because they provide no support to the top and outside of your foot, which can easily lead to an ankle sprain." Why: "This sneaker is a decent walking shoe as long as the forefront is wide enough to accommodate the wearer's toes comfortably and there are no underlying issues such as bunion present. Sometimes these shoes have a rigid collar, which may rub up against the Achilles tendon and irritate the back of your foot, so it is important to make sure these shoes are comfortable." Why: "Although I prefer Asics, New Balance, Brooks, and Saucony and I typically say just don't do it, the Nike Air Max sneakers are probably the best model of Nike sneakers as the sole consists of shock-absorbing gel pads that help alleviate the impact of each step. These sneakers help minimize arch fatigue and ultimately allow for a smoother and more natural motion when walking." Why: "These hiking boot/sneaker style are shock absorbing and provide good heel and ankle support and are ideal for hiking. However, they are too bulky and heavy for everyday use and may cause muscle fatigue, which can lead to posture changes as well as other aches and pains." Why: "This shoe is a good walking shoe because it has thicker and rugged soles to provide greater traction and stability of the shoe to help minimize injuries. Traction slip-resistant rubber outsoles help avoid slips and falls, which result in a severe ankle and/or leg sprain, fractures, and other serious injuries." Next, read about more podiatrist-approved shoe trends beyond just sneakers.